Welcome! 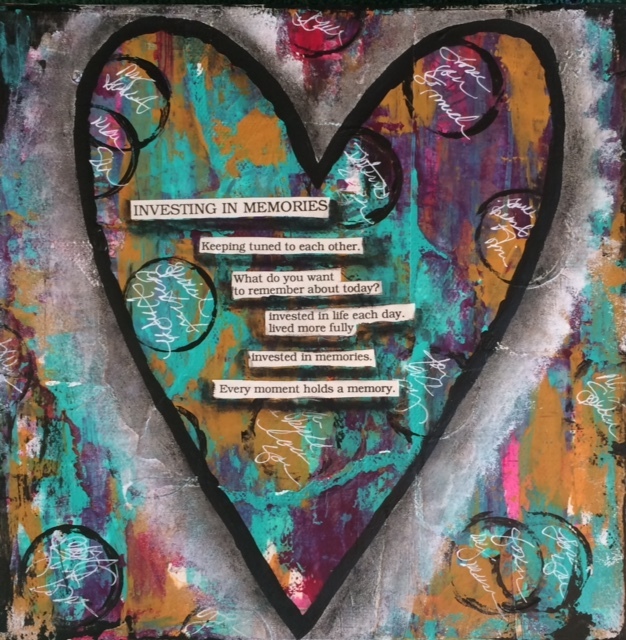 I am so glad you are here and I am excited to share with you my “Thoughtful Heart” mixed media tutorial. This tutorial is perfect for anyone from beginners to someone who has been creating for a while and would like to learn a new technique. It is simple, fun and easy and can be done in a short afternoon. These hearts are also customize-able. So whether you are creating this for yourself, a friend or a loved one, no two will look the same. I have included a supply list below. These are the supplies I used but you can use whatever you have on hand or whatever colors you prefer. The supply list includes two photos. The photo you see here is what I will demonstrate in the video. I have also included a photo of another heart using a different color palette and I will show you yet two more in the video. There are lots of options. Feel free to branch out or stick to the video. I would love to see what you create. I have created a “Thoughtful Hearts” Facebook Closed Group where you can post your work, share with each other, ask questions, etc. I am happy to add you to the group if you like. You can also post your work in the comments section of this page if you prefer. Please contact me if you have any questions or problems with access to the video, supply list, Facebook page, etc. Thank you and I hope you enjoy creating your “Thoughtful Heart”.